[...] And it is a video animation which rises above any photographic work in really jarring our sense of what the individual image contains. 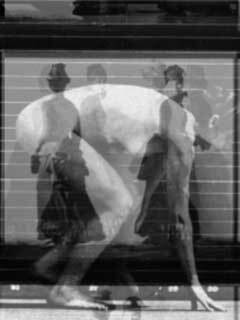 By Denise Webber and entitled Clay, the video brings together much of the work of the Victorian photographer Eadweard Muybridge. Muybridge is a curious figure who took a great many stilled images of naked bodies in motion, usually against a grid-type backdrop which allowed him to carefully calibrate their individual steps. These small images were then displayed together on one sheet so that they might, for example, show the entire cycle of a single step. It was a fascinating series of work and telling of the enthusiasm the new medium was greeted with in the 19th century scientific community. Though there is undoubtedly a great optimism behind these images, many of them, certainly those of dwarves or obese women, seem shameful in their exploitation. Yet Webber's gentle animation of these images gives them an afterlife which defies the chilly cold of Muybridge's calculations. She has overlaid the images with ringing bells which begin as the characters emerge into life from a century of static slumber and give their stiff actions a joyous sense of rebirth. Conceptual photography doesn't often deliver winning images like these and currently it is certainly photojournalism and documentary [...] which will command more attention and greater sales. But it would be a great shame if this impoverished current in documentary photography were to entirely occlude the work of some major talent.